Concrete countertops offer a number of advantages over other countertop options. With the advent of GFRC material systems for casting a concrete countertop, now any contractor can form, place, finish and install their concrete countertop project with just a little effort and attention to detail. You can learn how to make concrete countertops in North Carolina and South Carolina! The Xtreme Series GFRC Material Systems and Cheng D-FRC Bag Mixes from SureCrete Design Products make concrete countertops possible! Concrete countertop training and materials are available in our Charlotte NC showroom and training center. SureCrete Design Products XS PreCast GFRC Cast Concrete and Concrete Countertop Mix is an engineered, commercial grade pourable casting mix. Our patented blend is formulated with everything in the bag and is available in gray or white cement base. Blend one bag of XS PreCast GFRC cast concrete mix with one-gallon of the liquid modifier additive with color of your choice, mix and pour. It’s just that easy. XS PreCast requires no additional reinforcement. The mix achieves high flex and compressive strength, allowing for thin concrete castings and pours to greatly reduce labor expense as well as weight. XS Terrazzo is an engineered GFRC concrete casting mix designed for blending with your selected glass aggregates, stones, shells or other decorative aggregate. Within twelve hours of casting, pieces are ground to reveal the decorative aggregate. XS Terrazzo may be cast thin – down to one quarter inch – then backed with XS PreCast or XS Backer, dramatically reducing the cost of cast concrete and concrete countertops with exposed aggregate. No additional reinforcement is required. Cast and demold times are fast, lowering labor cost. XS Face Sprayable GFRC Concrete Mix is a dual component cement based bag mix that perfectly reads the mold or casting surface providing a near flawless precast casting for concrete countertops, furniture, tiles, wall panels and much more. XS Face Mix is available in a gray and white cement-based formulations. XS Face significantly reduces the materials and labor required to construct traditional precast concrete. It is designed to be used in conjunction with XS PreCast or XS Backer. With a broad range of coloring and texture selections along with the manipulation of water demand and placement, design considerations are nearly limitless. XS Face produces concrete countertops, fireplace mantles and facades, shower surrounds, wall panels, furniture and many other architectural cast concrete elements. XS Face is the perfect medium for residential, commercial, and industrial applications. XS Backer Mix is a Glass Fiber Reinforced Concrete blend available in white and gray cement base for reinforcing cast concrete pieces. XS Backer is designed to be used in conjunction with XS Face, XS Terrazzo or XS Precast Cast Concrete and Concrete Countertop Mix. XS Backer eliminates the need for additional steel reinforcement. Using the material reduction method that includes XS Backer, cast concrete pieces may be made thinner to reduce weight and labor cost. XS TruColor from SureCrete Design Products is pre-measured integral color powder for use with any XS cast concrete and concrete countertop mix. XS TruColor eliminates the need to measure and weight pigment for cast concrete projects. Using XS TruColor in your cast concrete or concrete countertop project assures you of consistent color throughout all pieces. 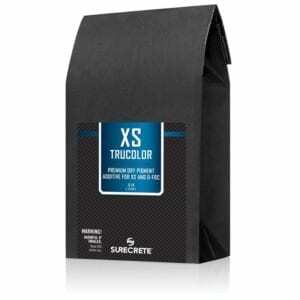 XS TruColor is specifically formulated to saturate the Portland cement in our XS GFRC bag mixes to achieve extremely rich and vibrant colors not typically seen in cast concrete. XS Slurry concrete slurry mix is specially designed to fill pinholes and voids in concrete casting pieces. Just add water and optional color to fill concrete countertops wall panels and other cast concrete projects. 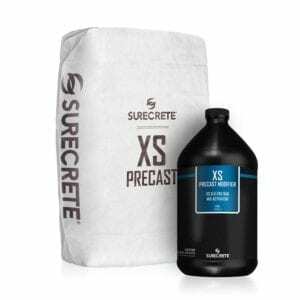 SureCrete Design Products XS Slurry cast concrete slurry mix was designed to quickly fill voids and pinholes in precast concrete pieces or any concrete where a smooth surface is desired. When combined with XS TruColor packs, it allows design elements to match, complement, or contrast with the concrete piece. The incredibly small aggregate used to formulate the XS Slurry counter top mix product allows it to be used to easily fill voids that other are simply unable to fill efficiently. XS-327 is a Water Based Hybrid Polyurethane Sealer for cast concrete and concrete countertop projects. XS-327 is a penetrating and food safe sealer for concrete countertops. XS-327 provides excellent scratch resistance and chemical resistance making it the best concrete countertop sealer for all commercial, industrial and residential cast concrete. XS-327 is available in a natural Matte finish, and also in Semi-Gloss for subtle color enhancement over cast concrete. XS-327 is a UV Stable cast concrete and countertop sealer that may be used outdoors on exterior cast concrete in full sun. 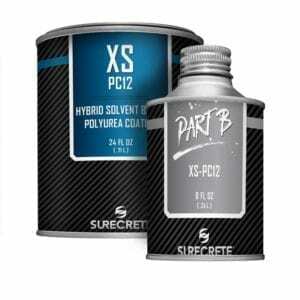 XS PC12 by SureCrete Design Products is a solvent-based clear polyurea high gloss concrete countertop sealer. XS PC12 is a film forming and color enhancing gloss cast concrete sealer with excellent strength, flexibility and durability for concrete countertops and other cast concrete pieces. PC12 is the best high gloss sealer for kitchen countertops, bath vanities, shower wall panels and other cast concrete pieces. SureCrete’s XS casting foam rails system is elegantly simple: eliminating ripping material, screwing, nailing, and in most cases, caulking to create the side rails in forming precast projects. It consists of 3 elements: Polystyrene foam rails, Clear facing tape and PSA tape. Whether forming from 3/4” up to 2” thick, form edges are true with no bleeding between casting surface and XS Forming. Installation tools required are just a tape measure, pencil and knife. Unlike conventional cast concrete forming systems that are made with 2×4 lumber pieces, saw-cut melamine or other materials, the XS Forming system provides a much more lightweight, versatile and infinitely more cost efficient method for forming your precast concrete pieces. Training to learn how to make concrete countertops is available in full three-day classes and individual instruction. Contact us for more information on GFRC Glass Fiber Reinforced Concrete Casting material systems at (Charlotte) 704-333-4235 or (Raleigh) 919-794-7442, or use the Contact Us page to discuss these concrete countertop products. Product delivery is available anywhere in North Carolina and South Carolina, to Asheville, Charlotte, Greensboro, Raleigh, Fayetteville or Wilmington NC, or Columbia, Greenville, Florence or Charleston SC. Additional information on these GFRC material systems for casting concrete countertops, architectural elements, concrete wall panels, concrete fireplace surrounds and other decorative projects in North Carolina and South Carolina. SureCrete Design Products XS Backer Mix is a dual component cement based bag mix that is unmatched in fiber loading. It is not a stand-alone blend but XS Backer significantly reduces the materials and labor required to construct traditional precast concrete. Reinforcement steel is eliminated, thinner precast pieces are routine, quicker production times are accomplished. A stronger, denser and more flexible cementitious composite is created by combining cutting-edge technology with modern fiber advancements. With a broad range of coloring and texture selections along with the manipulation of water demand and placement, design considerations are nearly limitless. 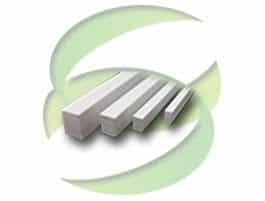 XS Backer, when used in conjunction with XS Face, XS Terrazzo or XS Precast, produces concrete countertops, fireplace mantles and facades, shower surrounds, wall panels, furniture and many other architectural elements. XS Backer Mix for Concrete Countertops and Cast Concrete is available at Turning Point Innovations in Charlotte North Carolina. Coverage: 50 pound bag yields approximately 9.8 square foot at 1/2″ thick, or roughly 0.43 cubic foot. XS Face Sprayable GFRC Concrete Casting Mix was specifically designed for precast concrete fabricating professionals in North Carolina and South Carolina looking to mass-produce furniture and other precast pieces that require complex, three-dimensional molds but need to still maintain a consistent look and smooth texture across all surfaces. Through the use of a hopper gun or similar spraying equipment, XS Face can be applied with near identical consistency across a multitude of surfaces and shapes, allowing for the creation of some spectacular architectural pieces at a fraction of the work time of conventional cast concrete. The dual component high strength precast concrete countertop mix greatly reduces the materials and labor typically required. With no reinforcement needed, thinner precast pieces are used, and quicker production times are accomplished with higher strength. XS PreCast from SureCrete Design Products and available at Turning Point Innovations in Charlotte NC is stronger, denser, and a more flexible cement composite, created by combining cutting-edge technology with modern fiber advancements. With a wide range of color and texture selections and the addition of optional aggregate loading, design considerations are nearly limitless. XS PreCast Cast Concrete Mix is used for concrete kitchen countertops, fireplace mantles, facades, shower surrounds, wall panels, furniture and many other architectural elements. SureCrete has partnered with CHENG and The Concrete Exchange to make a vibrant gray cement formula available in the form of the CHENG DFRC Casting Mix. DFRC Casting Mix is an advanced, fiber reinforced high strength gray concrete countertop mix that is formulated to allow saturated colors from a convenient dual-component package. 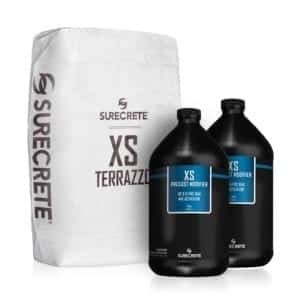 Coverage – 50 lb bag = approx 9.8 sq ft @ 1/2″, 7.2 sq ft @ 3/4″ or roughly 0.43 cu ft.
Surecrete Design Products XS Terrazzo casting mix uses cutting-edge technology with modern fiber additive for concrete countertops and other applications with an exposed aggregate terrazzo look. XS Terrazzo mix is a dual component precast concrete bag mix to which decorative aggregate is added and later exposed to create the unique, polished look of terrazzo. It greatly reduces the materials and labor required to construct traditional precast terrazzo. No reinforcement steel is needed, thinner precast pieces are routine, and quicker production times including grinding and polishing are accomplished. A stronger, denser and more flexible cementitious composite is created by combining cutting-edge technology with modern fiber advancements. With a broad range of coloring and the addition of decorative aggregate, design considerations are nearly limitless. XS Terrazzo produces concrete countertops, fireplace mantles and facades, shower surrounds, wall panels, furniture and many other architectural elements. XS Terrazzo is available to cast concrete professionals in North Carolina and South Carolina. Use one XS Color Pack per gallon of Xtreme Modifier with any GFRC or D-FRC concrete casting system to produce reliable and predictable color in your project. The XS Color Packs are specifically formulated to saturate the portland cement in our Xtreme and DFRC Series bag mixes to achieve extremely rich and vibrant colors not typically seen in casted concrete. XS Color Packs are in stock at Turning Point Innovations in Charlotte NC. SureCrete Design Products Xtreme Slurry is a just-add-water system used to fill pin holes and voids, and as a secondary accent in Travertine, Pressed and other visual textures. Pigment the white-base Slurry with Color Pack or other tints. Use XS Slurry in contrasting colors to create beautiful visual textures that emulate the look of natural stone found in North Carolina and South Carolina. SureCrete Design Products XS327 is a premium cast concrete countertop sealer that when fully cured is a food-safe clear coating. Available in matte or semi-gloss finishes, XS-327 is a water-based hybrid polyurethane that is UV stable and scratch resistant clear concrete sealer. XS-327 cast concrete countertop sealer is a specially formulated two component water-based, moisture cure, high solids hybrid polyurethane coating designed for application over completed indoor concrete countertops and exterior cast concrete surfaces anywhere in North Carolina or South Carolina. XS-327 is a penetrating concrete sealer food safe for concrete countertops. XS-327 concrete sealer is environmentally friendly with very low VOC in a water base solution that, when cured, is certified food safe concrete countertop sealer. XS-327 is a high-performance clear top coat cast concrete sealer which generates the premier balance of strength, flexibility, chemical and scratch resistance. XS-327 concrete countertop sealer is ideally suited for both commercial and residential settings applied upon concrete countertops, fireplace surrounds, shower panels, floor tiles, wall panels, and all Xtreme Series products. 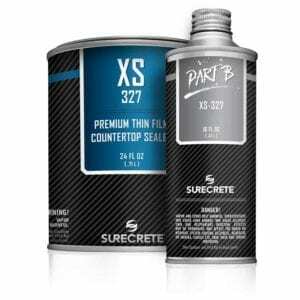 XS-327 sealer is stain resistant to most household chemicals and culinary items and is heat resistant to 300 degrees F.
SureCrete Design Products XS PC12 is a solvent-based clear high gloss concrete casting sealer that is UV stable and easy to apply. Manufactured with high-quality materials, XS PC-12 is a great choice for sealing your concrete cast pieces in North Carolina and South Carolina for a long lasting durable surface. XS PC12 is a high gloss concrete casting sealer that is a specially formulated two component, 59% solids hybrid solvent based polyurea coating designed for application over completed concrete surfaces. XS-PC12 high gloss casting sealer provides a UV stable, penetrating, film forming, color enhancing, and high gloss durable surface. XS PC12 is ideally suited for both commercial and residential settings applied upon concrete countertops, fireplace surrounds, shower panels, floor tiles, wall panels, and all Xtreme Series materials. With its extremely high chemical and scratch resistance, XS PC12 concrete casting sealer wet look is an ideal sealer for use on cast concrete pieces where you’re looking for a gloss coating as well as some color enhancement. SureCrete Design Products XS Forming system for cast concrete is elegantly simple, eliminating ripping material, screwing, nailing, and caulking to create the side rails in forming precast projects. It consists of 3 elements: Polystyrene foam rails, clear facing tape and PSA tape. Whether forming from 3/4” up to 2” thick, form edges are true with no bleeding between casting surface and XS Forming. Installation tools required are just a tape measure, pencil and knife. The simplest and most economical way to create decorative concrete countertop edge forms and profile on any concrete countertops or concrete furniture project is to use EdgeMolds. These reusable concrete countertop edge form liners are used to mold Eased Square, Ogee, Bullnose and Chamfer profiles on concrete countertops. EdgeMolds are provided in fifty-foot rolls by Turning Point Innovations in Charlotte NC, so you can form large concrete countertops islands, table tops and other pieces with just a single seam. Use EdgeMolds to form large and small radius sections, or trim with just a razor knife for corners. The best concrete countertop mix and GFRC systems in North Carolina and South Carolina are available from Turning Point Supply in Charlotte NC and Raleigh NC.